The other night I was in the mood for soup and homemade bread. I admit that I don't (ever) truly follow recipes, but use them more as a 'guide' of sorts, and I rarely measure. Still, I'm going to attempt to share this soup recipe with you because it was so yummy and perfect for a cold rainy evening. 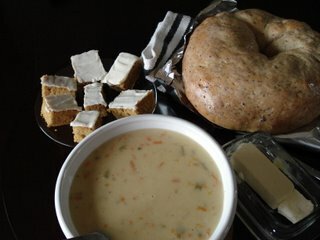 I added things 'on a whim' and ended up with a wonderful Spicy Vegetable Cheese Soup... so that is what I'll call it. Whisk into the liquid and stir until thick over medium high heat. Reduce to medium and add 1 c milk. 1 3/4 c assorted shredded cheese, I used monterey jack with jalapeno, and cheddar. When heated through and cheese is melted... serve.